Yoga teacher and veteran author Kate Hanley shares her expert advice on how to reduce and prevent stress with over 100 simple and inspirational exercises. Eight out of ten Americans report being stressed. In Stress Less, you can learn how to conquer stress and find inner peace with these practical mindfulness exercises. Each exercise can help you pause, evaluate your mental state, and pull yourself out of a heightened state of anxiety and back down to a calm, clear-minded base. Each page has a prompt that can give your mind, body, and heart a moment of peace in a world of chaos. Kate Hanley is an author, yoga teacher, and personal development coach who helps busy women focus on the things that matter so they can stop stressing about the things that don’t. In addition to working one-on-one with clients, Kate teaches and speaks about mindful time management, avoiding burnout, and finding work-life balance at companies and events. She’s been quoted in Harvard Business Review, The New York Times, Fortune, and has appeared on the Today show, where she noticed seconds before the cameras started rolling that her sweater was on backwards—it was the perfect opportunity to practice what she teaches. Kate lives in Providence, Rhode Island, with her husband and two kids. Visit her at MsMindBody.com or on Twitter at @KateHan. "Stress is an unavoidable part of our modern, hectic lives. But what if there were simple techniques you could use to restore your calm stat whenever life starts to feel overwhelming? 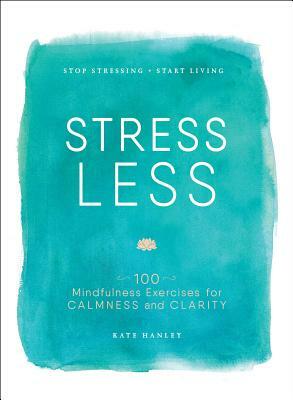 Mindset coach and yoga instructor Kate Hanley outlines 100 ways to do just that in her new book, Stress Less. Whether it's a simple stretch or a visualization exercise, each brief activity is designed to bring you back to your center in minutes." "A field guide with 100 exercises for calmness and clarity you can do in less than two minutes all day long. Kate’s message is important: we can choose calm any time we want. But for bedtime, sleep, and particularly if we have children, wind-down time … comes in before pajama, toothbrush, and tuck-in time."